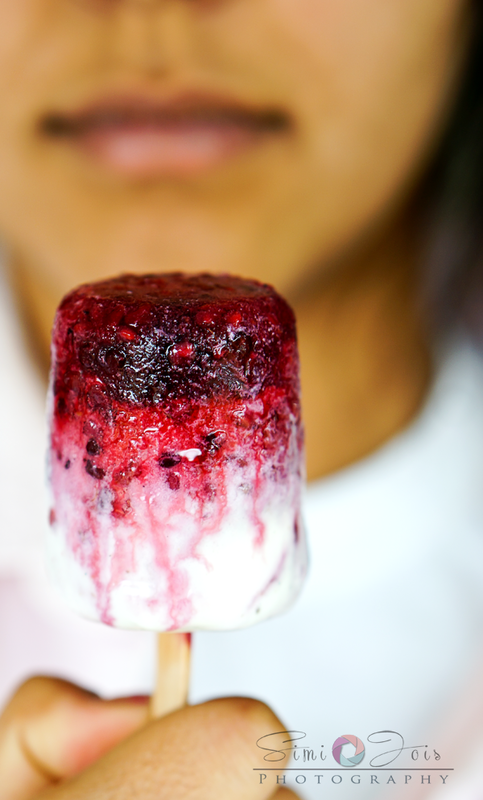 This is going to be a pix heavy post as I am sharing 2 recipes: creamy vanilla-berry pop and the other one plain berry pops. 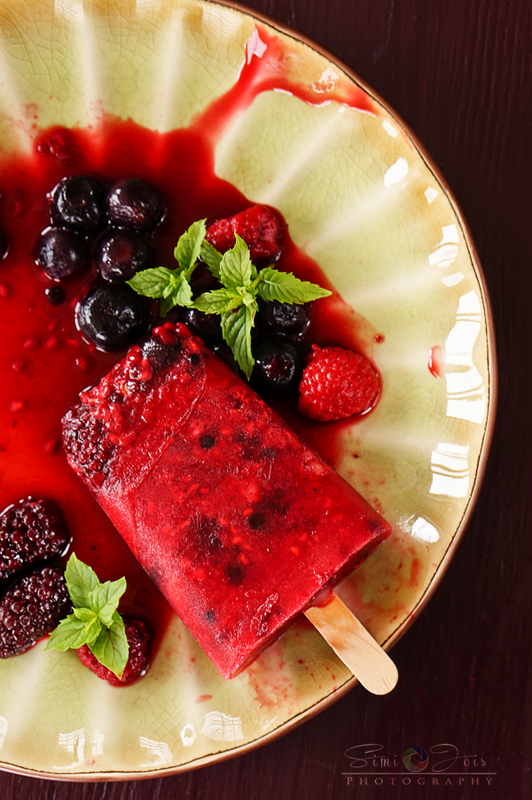 Summer is all about ice-creams, fruit pops, bbq, picnics, finger foods. Am always looking for something EASY and quick, I really do not want to spend a lot of time in the kitchen and at the same time I want to create something that looks and tastes good. If it is healthy, a big thumbs up! 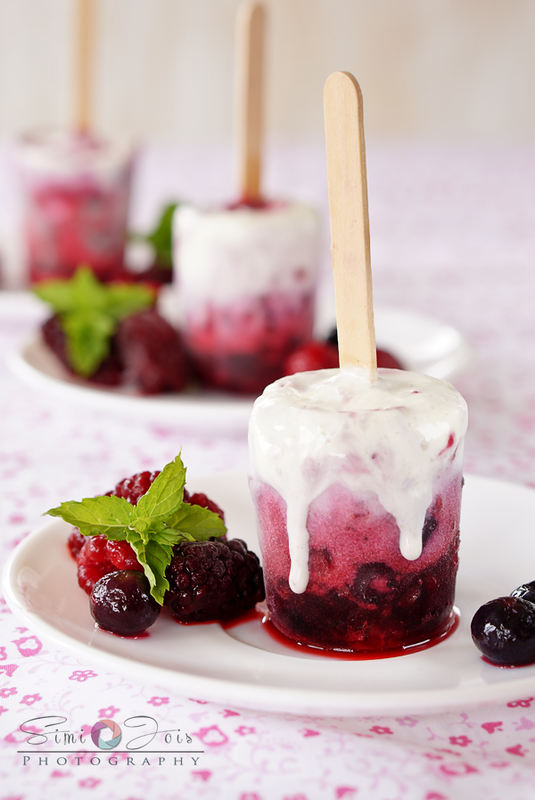 I love pops and this one is guilt-free and I did eat multiples of them ;) The best part, it has real fruit - not from some concentrate with tons of food color, If you are looking for something rich and creamy, you have these tiny vanilla-berry pops. I love the size, it’s really so cute. I loved both and it is hard for me to pick one over the other. There is nothing much to it. 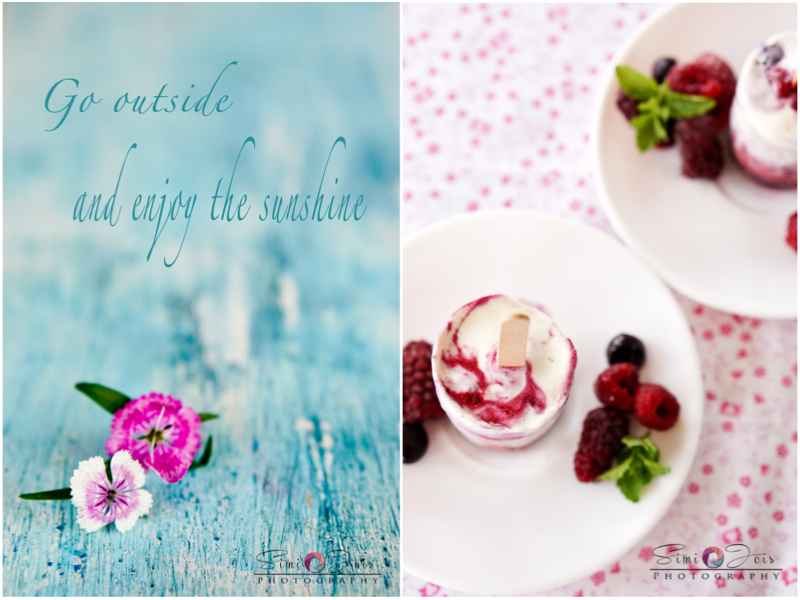 They looked so bright and summery and tasted so delicious, I just had to share it on the blog. Hope you guys have a wonderful long weekend, here in the US. Happy 4th of July and can’t wait to bloghop to see some amazing grilling recipes. I had some questions about my gear - I use Sony Nex-6 ( mirror less camera), lens 16-50mm and 50mm, that’s all, nothing fancy. For post processing I use photoshop elements - since am not so tech savvy, am not that good with post processing, something I need to work on. Any questions, inputs, email me or just leave a comment. I did not add any sugar, but if you want to add go ahead. 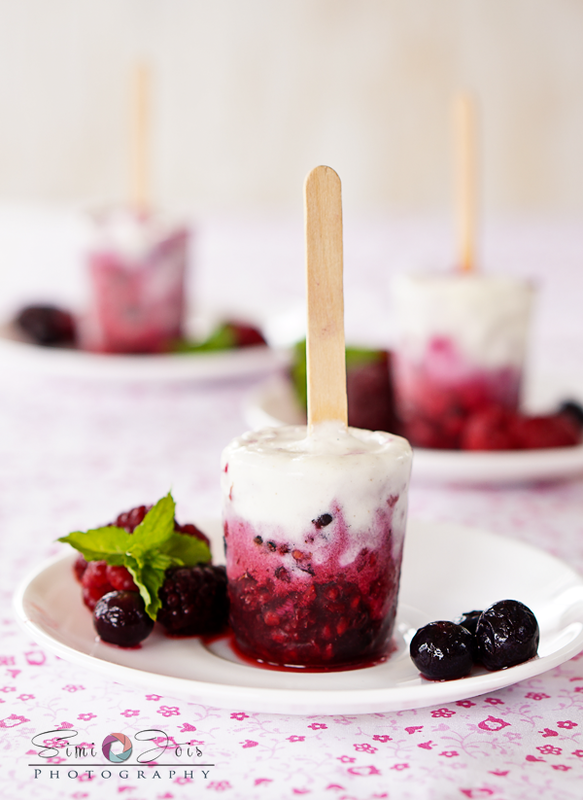 Take the popsicle mold add the massacred berries on the bottom and vanilla ice-cream on the top, add the wooden stick, swirl it a bit with a toothpick to make some interesting patterns, freeze for 4-5 hours. Remove from mold and serve chilled. Dissolve the sugar in the orange juice and keep aside. Thaw the berries and mush them with a fork, mix them into the orange juice and add the candied ginger. 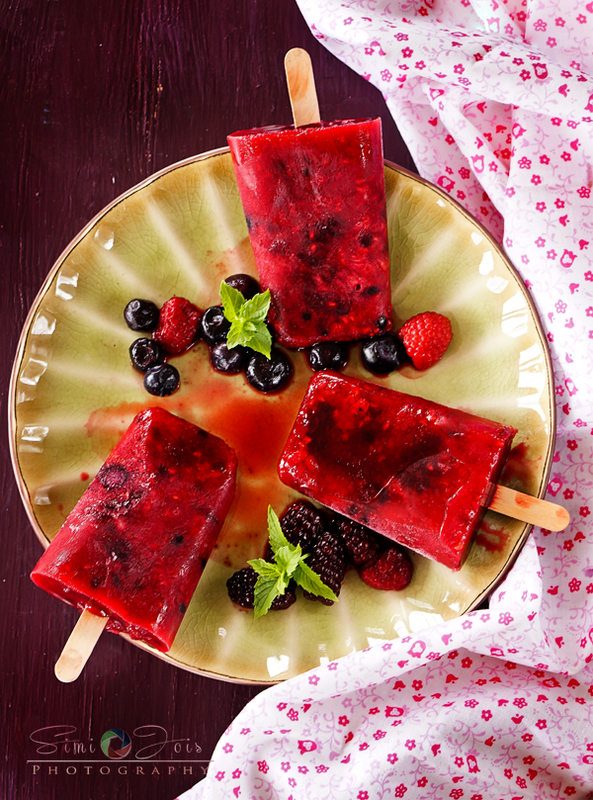 Pour them into the popsicle mold and freeze them for 30 min, remove from freezer and add the stick. Freeze overnight, enjoy chilled. wow! I cannot take my eyes off. super! i would love both of them! Yeah thats a perfect swirl effect..perfect some summe! How clever to have a two in one deal. I would be hard pressed to choose. In fact they are so beautiful I almost---I said almost----would find it difficult to eat either one.